(1) Technicalities about the survey: The telephone poll was conducted between Aug. 31 and Sep. 3 by the Egyptian cabinet's Information and Decision Support Centre. (2) Were there no Egypt-Israel peace treaty, Israeli forces would still control the Sinai, meaning that Ariel Sharon's 2005 withdrawal from Gaza would not have had a much smaller impact than it has had. Nov. 29, 2006 update: The Egypt-Israel treaty was the highlight of Jimmy Carter's presidency, so his rethinking the topic has obvious implications, given his credentials as someone who understands the Middle East. That's a particularly relevant point these days, as Carter is hawking his new book on the Arab-Israeli conflict, Palestine Peace Not Apartheid. Incidentally, back in 1985, I reviewed Carter's first book on this topic, The Blood of Abraham, for Commentary magazine. 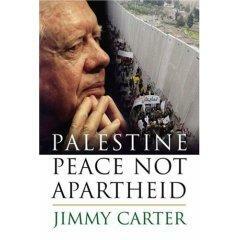 Jimmy Carter's new book, "Palestine Peace Not Apartheid." Dec. 4, 2006 update: For an excellent summary of Israeli worries about Egypt, see today's "Not the peace we expected," where Yuval Steinitz runs through the diplomatic, terrorist, military, and political dimensions of the problem. Mar. 1, 2006 update: Jeffrey Azarva looks at the worrisome security dimension of the Israel-Egypt relationship in "From Cold Peace to Cold War? The Significance of Egypt's Military Buildup." June 8, 2007 update: Amir Oren reviews the depths of the Israel-Egypt relationship in "When the lid is afraid of the pot." Jan. 22, 2008 update: Mira Tzoreff reviews Egyptian press responses on the 30th anniversary of Sadat's visit to Jerusalem at "Commemorating or Forgetting? Sadat's Peace Initiative As Reflected in the Egyptian Press" and the picture is not a pretty one. Mar. 26, 2009 update: For a round-up of current (positive) reactions to the treaty, see my weblog entry, "Assessing the Egypt-Israel Peace Treaty, Thirty Years Later." An Egyptian appeals court on Saturday upheld a ruling that orders the country's Interior Ministry to strip the citizenship from Egyptians married to Israeli women. ... In upholding last year's lower court ruling, the appeals court said Saturday that the Interior Ministry should present each marriage case to the Cabinet on an individual basis. The Cabinet will then rule on whether to strip the Egyptian of his citizenship. The court also said officials should take into consideration whether a man married an Israeli Arab or a Jew when making its decision to revoke citizenship. There are thought to be about 30,000 Egyptians married to Israelis, with the former overwhelmingly males and the latter females. In 2005, former Grand Mufti Nasr Farid Wasel issued a religious edict, or fatwa, saying Muslim Egyptians may not marry Israeli nationals, "whether Arab, Muslim, or Christian." The possibility of a Jewish spouse was not mentioned. Mohammed Sayyed Tantawi, the late Grand Sheik of Cairo's Al-Azhar, Sunni Islam's premier institution and oldest university, has said that while marriage between an Egyptian man and an Israeli woman is not religiously forbidden, the government has the right to strip the man of his citizenship for marrying a woman from "an enemy state." Dec. 31, 2010 update: "WikiLeaks show US frustrated with Egypt military" reads the Associate Press story by Sarah El Deeb. It further reveals how focused the Egyptian military is on a supposed Israeli threat, despite the 30+ years of a formal peace treaty in place. U.S. diplomatic memos leaked this month show previously unknown friction between the two allies over military assistance and strategy. .... to the dismay of the Americans, the Egyptian military continues to see Israel, its enemy in four wars spanning 25 years in the last century, as its primary adversary 31 years after the two neighbors signed a peace treaty. Egypt has resisted sending troops to Iraq and Afghanistan and only recently started training military personnel from the two nations where U.S. forces are fighting stubborn insurgencies. Instead, the memos say, Egypt places emphasis on trying to achieve military parity with Israel through the acquisition of modern conventional arms such as aircraft and tanks. One U.S. diplomatic memo said Congressional debate to review - and attach conditions to - aid to Egypt may act as a pressure tool to force the Egyptian military to change its doctrine. Hossam Sweilam, a retired Egyptian army general, says Egypt continues to view the defense of Sinai, the mostly desert peninsula standing between mainland Egypt and Israel, as its core mission. Despite the peace treaty with Israel, he said, there are recurrent threats from Israeli officials that justify this doctrine. "The U.S. should not impose on us reformulating our military the way it wants, which we think is ultimately what suits Israel and we don't want to do what suits Israel." Apr. 25, 2011 update: A Pew Global Attitudes opinion survey finds that 54 percent of Egyptians wish to annul the treaty with Israel and 36 percent wish to maintain it. Comment: Frankly, that's a higher number than I would have expected for keeping the status quo. Israel is in the process of watching a peace treaty unravel. I don't mean the one with Egypt, but the one with Syria. No, I'm not crazy. Since Henry Kissinger's shuttle diplomacy in 1974, the Israelis have had a de facto peace agreement of sorts with the al Assad family. After all, there were clear red lines that both sides knew they shouldn't cross, as well as reasonable predictability on both sides. Forget about the uplifting rhetoric, the requirement to exchange ambassadors and the other public policy frills that normally define peace treaties. What counts in this case is that both sides observed limits and constraints, so that the contested border between them was secure. Even better, because there was no formal peace agreement in writing, neither side had to make inconvenient public and strategic concessions. Israel did not have to give up the Golan Heights, for example. And if Syria stepped over a red line in Lebanon, or say, sought a nuclear capacity as it did, Israel was free to punish it through targeted military strikes. There was usefully no peace treaty that Israel would have had to violate.